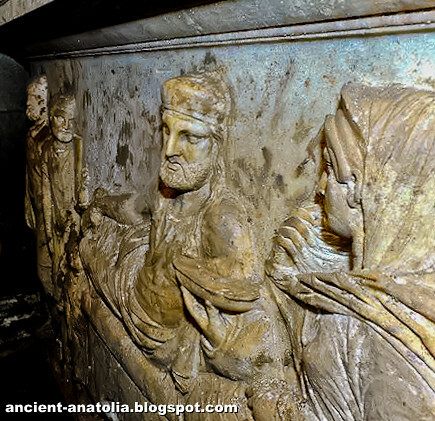 The 2400-year-old carved tomb found, decorated with reliefs of a bearded reclining man, probably belonged to Hecatomnus, ruler of Milas, the ancient Mylasa, founder of Hecatomnid dynasty, when Turkish Police raided a house used by people suspected of digging illegally for antiquities and discovered two tunnels leading to an underground tomb that housed an ancient marble sarcophagus and frescoes. Milas discovery is the first time in years that authorities have found what could be an important archaeological site while chasing looters. Hecatomnus was king or dynast of Caria in the reign of Artaxerxes II of Persia (404–358 BCE). Hecatomnus was appointed by the Persian king to command the naval forces destined to take part in the war against Evagoras of Cyprus, and continued to hold possession of Caria in a state of virtual independence until his death. The date of this cannot be ascertained with certainty, but we learn from Isocrates that he was still ruling in 380 BCE. He left three sons, Mausolus, Idrieus and Pixodarus – all of whom – in their turn, succeeded him in the sovereignty; and two daughters, Artemisia and Ada, who were married to their brothers Mausolus and Idrieus. Hecatomnus was a native of Mylasa, and made that city his capital and the seat of his government: hence we find on his coins the figure of Zeus Labrandenos, represented as walking and carrying a bipennis over his shoulder, from the celebrated temple of that name near Mylasa. Mausolus took part in the revolt against Artaxerxes Mnemon (362 BC), conquered a great part of Lycia, Ionia and several Greek islands and cooperated with the Rhodians in the Social War against Athens. He moved his capital from Mylasa – the ancient seat of the Carian kings – to Halicarnassus, todays Bodrum. Mausolus was the eldest son of Hecatomnus, a native Carian who became the satrap of Caria when Tissaphernes died, around 395 BC. He is best known for the monumental shrine, the Mausoleum of Mausolus, erected for him by order of his sister and widow Artemisia; Antipater of Sidon listed the Mausoleum as one of the Seven Wonders of the Ancient World. The architects Satyrus and Pythis, and the sculptors Scopas of Paros, Leochares, Bryaxis and Timotheus, finished the work after the death of Artemisia, some of them working, it was said, purely for renown. The site and a few remains can still be seen in the Turkish town of Bodrum. The term mausoleum has come to be used generically for any grand tomb.